Due to the jet set, who happily make it home for months at a time during the peak summer season, chefs and restaurateurs have set up shop and making names for themselves within this bevy of islands euro zone. So, when investigating which places to dine at, I turned to American Express Platinum Card Concierge to help me plan my night of dining out, including finding a restaurant, setting up the bookings and arranging the times that worked best. (Europeans often dine late in the afternoon, siesta, and then they head out for a late night dinner that usually starts no earlier than 9 pm). I rang my American Express concierge and explained what I was looking for. There were two restaurants that kept coming up. The first one, a beach club/lunch spot, called Nammos, and an earlier rather than later dinner option, called Sea Satin. Due to the time change at home v. in Greece; it took her until the next day to confirm that we were in! Both restaurants on my hit list were well on their way into my Greek memory book. A short 10 minute drive from Mykonos harbor, consists of a series of a few hairpin turns up the mountain, then several winding turns down to the other side of the isle, and to the beautiful aquamarine bay of Psarou Beach, where Nammos sits front and center. lunch scheduled at 1:00 pm. What was great about the whole set up is that you come spend the day at this beautiful beach, dine throughout the day on snacks that are from the restaurant itself, which are delicious. Don’t miss the feta cheese salad delivered right to your lounger. Remember I mentioned the jet set bringing in sumptuous places to eat? Well, along with that comes hefty pricing on food and drinks. Make sure you check out Nammos’ drink menu. Peruse the bottles of champagne. $120,000 Euro for a bottle of Armand De Brignac Brut Gold. Lunch was served in their posh whitewashed beach inspired restaurant. It’s simply beautiful and chic, and so are their dining choices. One of the best meals I had traveling in the islands. Don’t miss the hamburger on black bun (squid ink makes the color). The calamari is to die for, and grilled octopus, which can equate to chewy rubber in most places, but not here. Also, choose one of the freshly caught fish from just off shore. Make sure to put your order in well before your lunch ressie, because they go quickly. Around 3 pm most days, and once every seafood morsel inhaled, this piece of paradise goes off. The calming Ibiza-esque lounge music transforms into pumping house music, which gets guests to their feet. Either it’s the lack of room between tables, or a little bit of exhibitionism, within no time; the tables and chairs become part of the makeshift dance floor. It took us an hour to get a cab, which would take us over to our second foodie spot, Sea Satin. Given high props by the American Express Platinum Card Concierge, I expected more of a fine-linen type restaurant with sunset views. The sunset views were spot on, but I was relieved to see a casual spot. 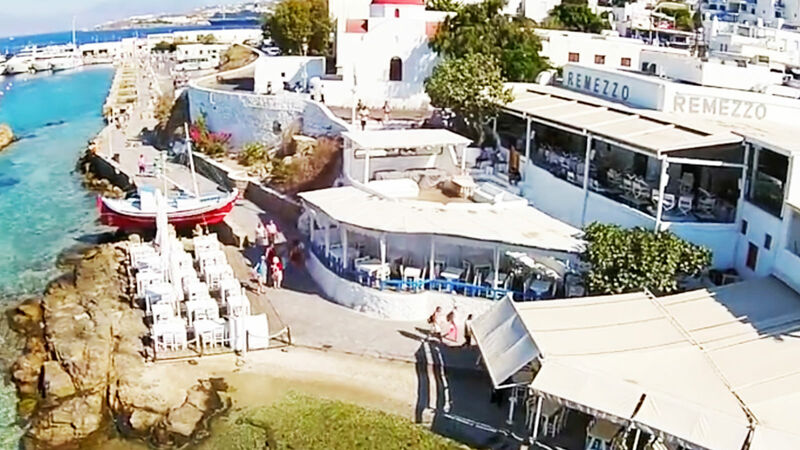 A little on the touristy side (but well worth the booking), the restaurant sits right under the most photographed spot on the island, the windmills. Don’t miss their eggplant salad with homemade Greek breads and the whole grilled barracuda fish with Greek salad and herbed potatoes. (A side of their French fries does the trick for an extra treat). When I’m travelling internationally I always use the American Express Platinum concierge service to plan a great night out (among other needs). It makes travel planning and where to eat that much simpler. Plus, they send updates and confirmation emails upon restaurant confirmations, and I didn’t’ have to worry about a thing. I found it especially necessary for them to find out sunset timing for Sea Satin, so I wouldn’t miss that perfect Greek sundown. It was truly a treat to share a glass of Ouzo and toast to my perfect Mykonos foodie day.